Parliament Square – where William Caxton, Sir Walter Raleigh (and lots of others) are buried | London My London | One-stop base to start exploring the most exciting city in the world. Where to begin? From where you are looking the weather-beaten lawn on the left (above) conceals hundreds of bodies including William Caxton, whose printing works were nearby, Wenceslaus Hollar, the brilliant engraver and the largest number of regicides you’ll find in an English church and, maybe, anywhere. Sir Walter Raleigh, who was executed across the road, is given more dignity, a resting place under the altar. The only grave you can actually see (near the side entrance) is that of Alexander Davis whose daughter Mary inherited nearly all of what we now call Belgravia and Mayfair. In 1677, aged 12 she was betrothed to a little known 21-year-old man called Sir Thomas Grosvenor whose family still own the same vast estates, now worth rather more than they were then. Welcome to the endlessly fascinating St Margaret’s Westminster, laden with history, yet the most passed-by church in London. It could be mistaken for a changeling child left outside the mighty Westminster Abbey (next door) for protection. In a way it is, having been set up by the Benedictine monks of Westminster Abbey around the 1050s so local worshippers would not disturb the monks at prayer or whatever next door. As you go in you are hit by a dizzy array of large, softly spoken, abstract stained-glass windows along the right wall by John Piper which provide a modernist descant for the deep blue medieval stained-glass window above the altar (above right) which arrived here after a Cook’s Tour of the realm. Featuring Henry Vlll and his first Queen at the bottom looking up at the blood of Christ spilling out from his body at the Crucifixion, it was created in Holland around 1526 and intended for a new chapel in the Abbey to commemorate Henry ‘s marriage to Catherine of Aragon. It was not best timed. 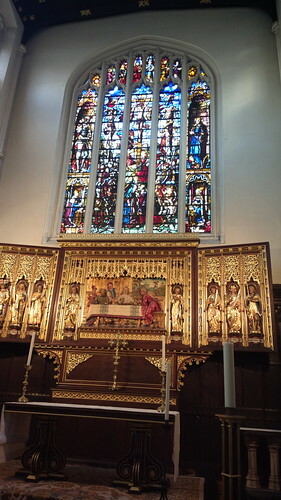 When the marriage was ended the window was dispatched to Waltham Abbey where it remained until Henry VIII dissolved the monasteries when it was transferred to a private chapel at New Hall in Essex where its Catholic symbolism would be less noticed. It came into the ownership of General Monk who apparently buried it to hide it from fanatical Puritans. It was subsequently purchased by Edward Conyers of Copped Hall in Essex (where Mary Tudor was imprisoned and A Midsummer Night’s Dream was first performed) whose son sold it in 1758 to the inhabitants of St Margaret’s for 400 guineas. Then it starts getting complicated. The Dean and chapter of Westminster regarded it as superstitious imagery and brought a lawsuit for its removal which lasted seven years before eventually failing. It was the religious equivalent of Charles Dickens’ perpetual law suite in Bleak House, Jarndyce v Jarndyce. The church of St Margaret (of Antioch) is of course a working church with regular services. 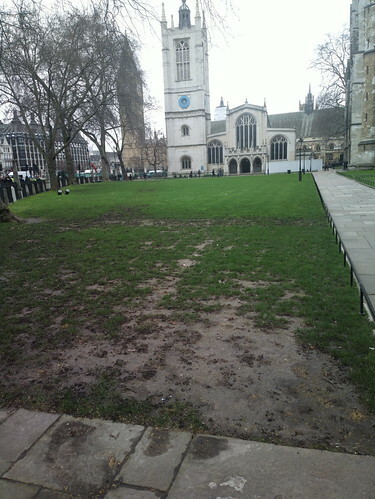 Its parish once stretched as far the end of the Strand but now it is mainly known as the church serving Parliament. It answers not to the Bishop of London but to the Dean and Chapter of Westminster Abbey who in turn, answer to the Crown as a “Royal Peculiar”. And those regicides? They were those who signed Charles l’s death warrant at the instigation of Oliver Cromwell and were held to account (sounds better than hanged, drawn and quartered) on the accession of Charles ll. There is a small bust of Charles I on the (outside) east wall of the church looking across the road at a big statue outside the House of Commons of . . Oliver Cromwell.